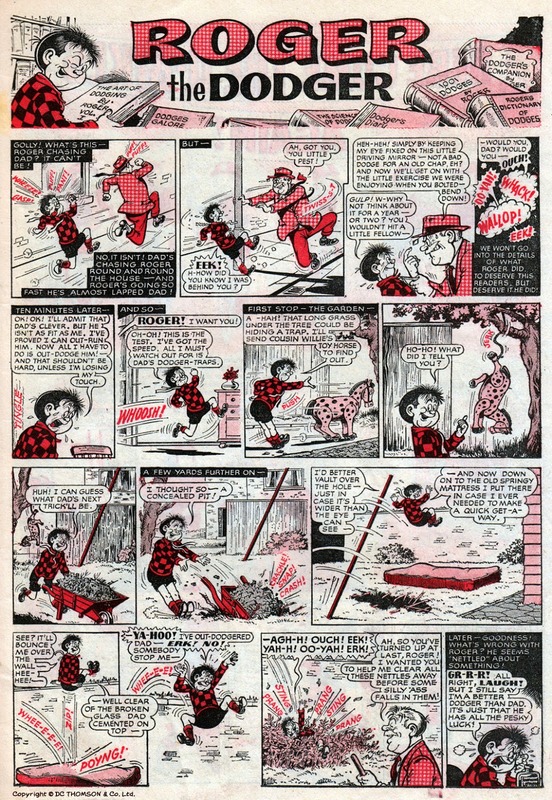 According to the book The History of The Beano, Ken Reid's final Roger the Dodger strip appeared in The Beano No.1152, dated August 15th 1964. I don't have many Beanos I've held onto from the sixties but luckily I do have that one, - and here is that very story! Ken Reid's last Roger the Dodger strip from 50 years ago! Ken Reid had been the original artist of Roger the Dodger since its beginning in 1953 (although I've seen at least one fill-in by Gordon Bell). Robert Nixon took over the strip when Ken left The Beano, and did an excellent job for many years, but it's Ken's manic version that many of us first encountered. Frank McDiarmid took over Big Head and Thick Head from the following week, doing a great 'ghosting' of Ken's style. The actual last work of Ken Reid's that Thomsons printed was in The Dandy Book for 1965, (and possibly in The Beano Book for that year, but I don't have that). However, as annuals (and summer specials) are drawn many months before publication, Ken would have drawn those strips before the two weekly ones I've shown here. It's still possible you read them, Paul. I was only 5 in 1964 too, but that's when I started reading The Dandy and The Beano. I distinctly remember the change in the art styles from Ken Reid to his successors. I still liked Roger the Dodger but there was something lacking, as though the magic had gone somehow. Even though Bob Nixon was an incredible talent, - absolutely one of the best, - I felt he never captured the same raw, manic, edge that Ken gave to the characters. My god, one forgets just how good Ken Reid was! His drawing really is exemplary! Looking at these I realise too, how much he influenced me as a kid. That said, I always hated the Dodger as a character. And his work just got better throughout the rest of the sixties. Truly outstanding and funny work. There'll never be another! Nice to see these landmark strips. As well as working on Big Head, Frank McDiarmid did a considerable run on Rodger, which I blogged about here. Got to love Ken Reid's work. 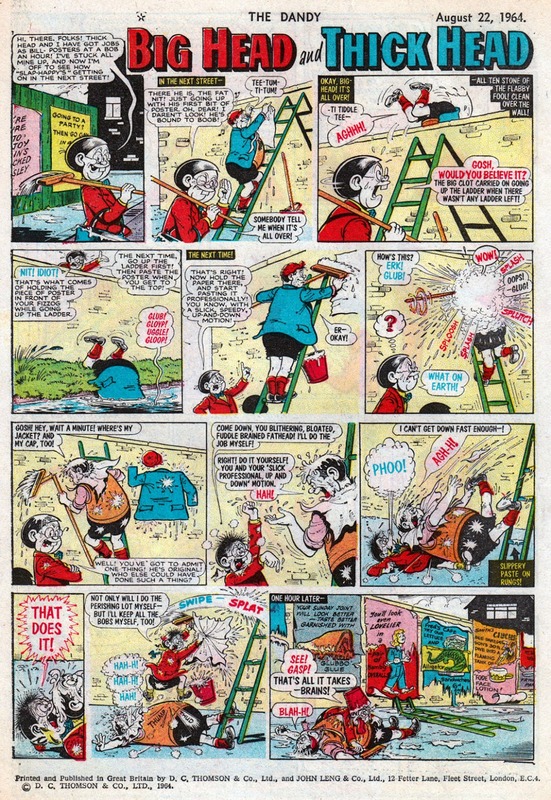 In my first review in Comics International Des compared my artwork to Ken Reid but of course I did not know who he was as the Beano artists were not allowed to sign their work. I went off thinking he was an underground comix artist such as Crumb or Shelton until Carl Cristlow told me who he was and that I should be extremely honoured. Man did I feel uneducated about the history of my chosen medium and made it my mission to get to know all the names of the classic DC Thompson artists. Not my fault though, I blame DC; they could have let them sign their work! That's something that DC Thomson finally rectified in the 1980s. Too late for Ken then, but at least he was allowed to sign his work for Odhams on Wham!, Smash! and Pow! in the 1960s. I Loved Ken's Dodger-Mind You Other Than His Football Stuff-Can't Stand Football-There's Precious Little From Ken That I Do Not Like.